Does this exist in your every day? Do you walk into your kitchen and feel stressed by the clutter, lack of cleanliness, or mayhem created by others? Let NY Times Best Selling Chef Frank Giglio lead you through a 2 week mini-course to get your kitchen to the place where it continues to inspire you. This topic is an important one for us, so we've decided to create this course to start you off in 2015 in the right direction. This 2 week course is an easy one to commit to and complete at your own pace. We want you to feel your absolute best every day. And it starts in your kitchen. Creating a healthy kitchen is your own home medicine cabinet. It goes beyond the food you cook and eat in it. What gear you are using to prepare the food, what cleaners you use, and what your ingredients are stored in, all play a role in the quality of your meals. Move around in your kitchen. Does the layout feel good to you? Unfortunately, not every kitchen was setup with efficiency and success in mind. It's not always realistic to tear down walls and build your exact dream kitchen overnight, so you need to make the most out of the space that you have. We want you to feel comfortable, inspired, and efficient in your own kitchen. Find out the tips and tricks from Frank to set yourself up for success. Why start 2015 with us? As the New Year approaches, millions of people commit to improving their lives in the upcoming year. We see many people join gyms, try out a cleanse, or take part in the latest fad diet in hopes to get healthier. Meanwhile, their kitchen still contains toxic chemicals, processed foods, unfavorable kitchen gear, and just overall clutter. In many parts of the world, January is an unfavorable month to try out restrictive diets or cleanses. For many of us, it's a time of reflection, going inward, and a time to make goals for the spring. This course is designed to help you dial in your kitchen, providing you with a healthy space to create nourishing meals for yourself and your family. — Review and discuss the layout of your kitchen - Rearrange as needed! *Please note: While we feel that you will get the most out of this course if you join the momentum of the other students and complete in real time, all lessons and assignments can be viewed and completed at your own pace. All calls are recorded and can be viewed at any time as well. Join Frank and learn how to set yourself up for success from anywhere in the world! 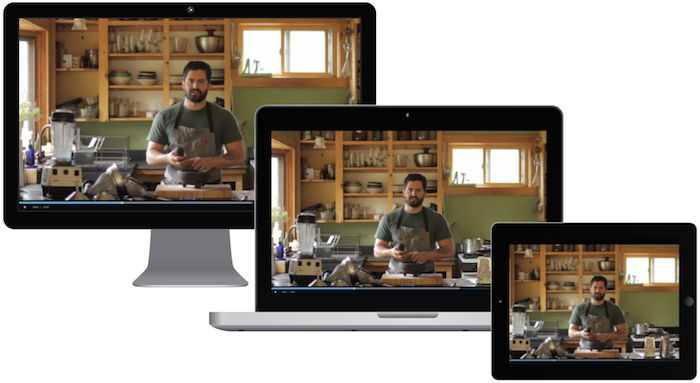 You'll also be able to have Frank and the lessons right there in your kitchen with you from any device you like. Course Registration is closed. Stay tuned for our next run! We're so confident that you are going to love every little piece of our New Year New Kitchen Course. If you are not 100% satisfied with your purchase of Three Lily Farm's 2 Week Kitchen Re-Vamp Course, please contact us for a full refund within 14 days of after completion of course. Refunds are only available with submission of all completed assignments and proof of participation in order to be eligible within 14 days.